*After posting this news, we have recieved additional information from Cray that states that the top plate is not being used for CPUs, but for the Slingshot interconnect. As a result, the system supports only 8 CPUs in 1U. The text below has been changed to reflect this new information. 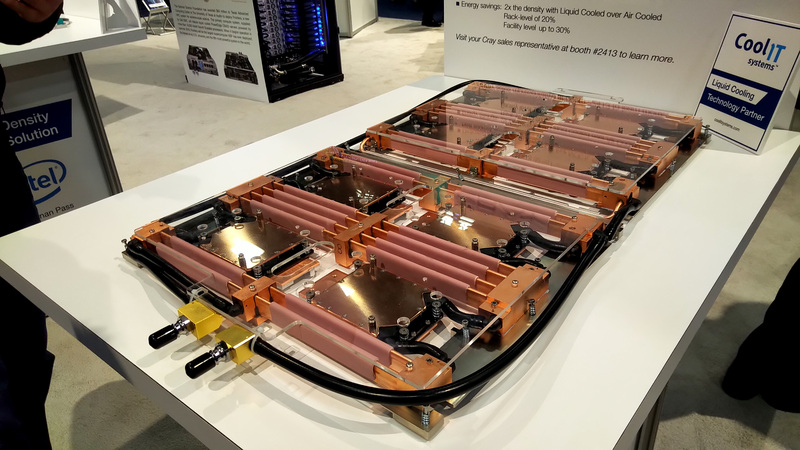 The Supercomputing show was a hive of activity, with lots of whispers surrounding the next generation of x86 CPUs, such as AMD’s Rome platform and Intel’s Cascade Lake platform. One of the big announcements at the start of the show is that Cray has developed an AMD Rome based version of its Shasta supercomputer deployments. It’s a bit difficult to see what is going on here, but there are what looks like eight processors in a 1U system. The processors are not facing in the traditional way for a server, in line with airflow, because the system is not air cooled. The cooling plate and pipes connect to separate reservoirs that also supply additional cooling to the memory. Of course in this situation we’re not in a dense memory configuration, given the cooling required. This display was being shown off in the CoolIT booth. 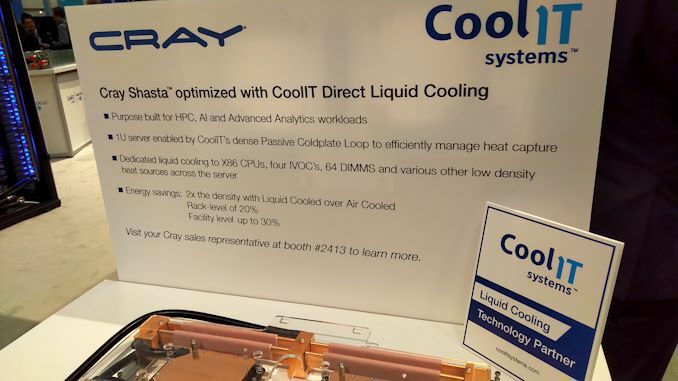 CoolIT is a well-known specialist of liquid cooling for both the consumer and enterprise worlds, and they had a few interesting points on their implementation for Shasta. Firstly, the eight CPU design with split memory cooling was obvious, but CoolIT stated that these processor cooling plates were designed to cool a CPU below and the custom Cray Slingshot interconnect above. We were told that with this design, the full cooling apparatus could go up to eight CPUs, several interconnect nodes, and up to 4kW. The cooling loops are split between the front and the rear, recombining again near the front. This means that four cooling plates and memory will be pumping through in each loop. There is a small question about how the memory all fits in, physically, but this is certainly impressive. CoolIT is claiming that its custom solution for Cray’s Shasta platform helps double the compute density over an aircooled system, offers 20% better rack-level efficiency, and up to 30% better facility-wide energy efficiency. Shasta is set to be deployed at NERSC as part of its upcoming ‘Perlmutter’ supercomputer, slated for delivery in late 2020. *This article was updated on Nov-20 with new information.